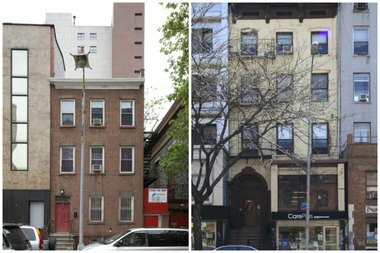 The Landmarks Preservation Commission will hold a special hearing to decide if 95 sites cityside, including 2 Oliver St., left, and 138 Second Avenue, right, should be landmarked. EAST VILLAGE — Two local buildings are being considered for landmark status after they were nearly removed last year following a backlog. Two Federal-style buildings located at 2 Oliver St. and 138 Second Ave. are on the agenda for a special Landmarks Preservation Commission hearing on Nov. 5, according to the agency. Both properties were submitted for landmark status years ago but were delayed. Last year, the LPC planned to quietly remove 95 sites from consideration for landmark status without formal public input, DNAinfo New York first reported. The properties, which were spread out across the city, included the iconic Pepsi sign in Long Island City, the Bergdorf Goodman building in Manhattan and Green-Wood Cemetery in Brooklyn. The city backtracked on the plan and began holding special hearings to address the backlog on Oct. 8. The Federal-style buildings up for consideration next month date from the 1820s and '30s, according to Greenwich Village Society for Historic Preservation, which objected to the de-calendering of both sites, along with two others, in a letter to the LPC last year. The property at 2 Oliver St. was first heard in 1966, according to an LPC fact sheet. The building, which was designed by Robert Dodge in 1821, was one of 13 Federal-style homes the GVSHP and New York Landmarks Conservancy recommended for landmark status in 2003. The building’s design and features are representative of other residences in that time period, according to the GVSHP. It is also notable for housing James O’Donnell, one of the first trained architects in the country, who designed the Fulton Street Market while living at 2 Oliver St., the group said. Meanwhile, 138 Second Ave., located between St. Marks Place and East 9th Street, was first calendared in 2009, according documents posted on the LPC’s website. The building, which was completed in 1833, is “a rare surviving example of a Federal-style row house,” with a Gibbs door surround, a high stoop, molded pediment window lintels and Flemish-bond brickwork, according to a research statement posted on the LPC’s website. The building's evolution from a single-family home to a multi-family dwelling with commercial space on the ground floor reflects the neighborhood’s transition from a rural area to one with a bustling mixed-use location, according to the statement. The properties will receive hearings as part of Manhattan A Group 1, which includes seven other sites in the area including 57 Sullivan St., the Mission of the Immaculate Virgin on West 56th Street and the Excelsior Power Company Building on Gold Street, according to the LPC’s website. Those who wish to speak at the hearing or submit a written statement are asked to email backlog95@lpc.nyc.gov by Oct. 29.